Learning to ride a bike can be a real challenge for children with dyspraxia. Learning to pedal and steer all at once is just too much. There are some great bikes now available which help solve this problem. Meet the ‘Strider Bike’ for kids up to 10 years. It’s proving very popular with ALL young riders because it is such fun! Read a blog about it on the supplier’s web site. If you would like to buy one of these, please do contact us. If you buy from the dealer, please mention Red Zebra. Sama Karate is great for all children, and a particularly good activity for those with dyspraxia – the structured, disciplined approach promotes focus, determination and self-control. Through this, children gain confidence, self-esteem and social skills. Karate is seen as ‘cool’ but is also a great way of getting fit and improving posture, balance, core strength and body awareness. The skills learned can be used in self-defence too! But it is not an aggressive sport, the ethos is based on mutual respect and support. It can help with relaxation and stress relief. The Dyspraxia Foundation has a factsheet for parents about martial arts to give you some background information. At the summer activity group, we had a lot of fun cooking. 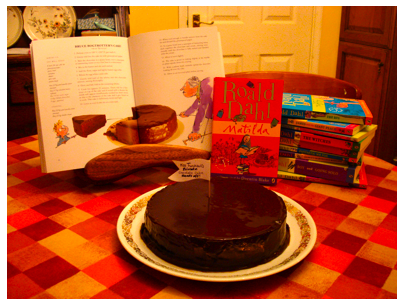 Our favourites were based on Roald Dahl books – including some ‘revolting recipes’ inspired by his work. We made ‘Blue Bubblers’ and ‘Plushnuggets’. If you like cooking, you may like to try the recipe for Bruce Bogtrotter’s Chocolate cake.